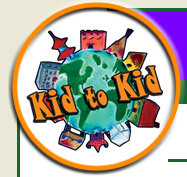 Our Kid to Kid Katalog has been created to help you and your children reach out to others who are in great need of the many things that we take for granted. Even a small gift makes a BIG Difference in the life of a needy child ... by providing food, clothing, immunizations, shelter, education, a comfortable bed and most importantly, love, through Children’s Hunger Relief Fund’s Kid to Kid Program. Imagine waking up everyday unsure if you will be able to find any food to eat . . .
$15 (15¢ a day) can help provide a nutritionally balanced meal for 100 orphans for one day in Africa. $55 (15¢ a day) can help feed one child in Africa everyday for one year. $36 can help supply three meals a day for a month for 10 children in Uganda or South Africa. AIDS has reached extreme levels across Africa. So far, the AIDS epidemic has left behind more than 13 million children without parents to take care of them. These children become homeless orphans forced to beg for help in the dirty city streets. Imagine waking up everyday unsure if you will be able to find any food to eat. With your help, children will receive three nutritious, balanced meals they desperately need. $40 can help supply two balanced meals a day for a month to homeless children in Nicaragua or Mexico. In Mexico and Nicaragua, many children are living alone on the streets, trying to survive. When the police find these abandoned children, they are weak and hungry. Wanting to help, the police bring them to one of our many loving homes because they know the children will be fed and well-cared for. $25 can help provide immunizations and annual growth monitoring for up to 100 children in Kenya. In Africa, measles, tuberculosis, polio and other diseases take the lives of millions of children every year. For children in the U.S., it isn’t a worry because we can go to the doctor and receive immunizations that will help our bodies fight against bacteria and viruses. For children in Africa, these diseases are a constant threat and many will die without the proper medicine. Help provide these vital immunizations to children in Africa who might not otherwise survive. $30 can help provide a water storage tank for a Kenyan family. Often children must walk for miles to find water. In Africa, lakes and streams dry up quickly leaving behind dirty, muddy, polluted water. Small bacteria thrive in the shallow water and can cause children to become very sick and die. You can help children have clean water by donating $30 towards a water tank. $15 can help provide food, clothing, education and school supplies for one child in Sudan. Because of the years of war in Sudan, children’s everyday routines, such as going to school, have been almost completely lost. Most of these children don’t have schools to go to - the buildings have been destroyed in government bombings. Classes often must be held outside, under the trees. They don’t have food for their lunches or school clothes to wear or books to help them learn.